“Pilates? Nah. I need a REAL workout.” I get it. You’re a guy, and you want a workout that will challenge you. Pilates can sometimes conjure up thoughts of a studio full of long, bendy women in Lululemon tights. Not exactly the place you’d expect to find training that improves functional fitness and sports performance right? Maybe it’s time to give those preconceptions a challenge, because Pilates can be a powerful tool in creating mobility, stamina and a deeper kind of strength. It can make you a better athlete, and help you better manage the physical demands of your day. Pilates for men. It’s a thing. And it might just be the thing your body is craving. The Pilates method trains whole body movement supported by a dynamic core; using body weight and specialized resistance equipment to work you in all planes of motion. If you’ve divided your workouts into leg day, arms & upper body day, and core work is an extra, then you’re missing some important stuff! Pilates will strengthen muscles you may have forgotten about, and create mobility you might not have thought possible. The benefits of Pilates are very different than the ones you get from cross-fit or traditional gym training – but they will add to the quality of your movement, and your life, in a pretty big way. 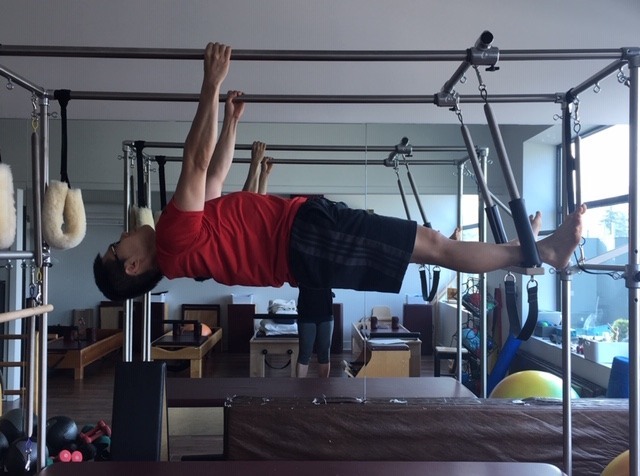 One of the main objectives of the Pilates Method is the development of a connected and stable core as the foundation for strength and mobility. First, we make sure you can access your deep system “core” properly. That means not just your deep abdominal wall but your pelvic floor, deep back muscles and your respiratory diaphragm. Then integrate that inner unit core with as much motion and load in your whole body as you can support. The goal is not just to build muscles, but to ensure that your core is toned and responsive enough to activate and support you automatically when you need it to move. The increased muscle mass that men often seek can sometimes go hand in hand with a decrease in overall mobility and flexibility. Reduced mobility is often an indicator that the body is lacking stability. If your easy range of motion is not what you’d like it to be – you may be missing the kind of strength that supports your structure. Bigger muscles may be trying work less efficiently as structural stabilizers; costing you in terms of joint mobility and ease. You feel strong – but your movement doesn’t flow well. Or maybe you feel strong, but you suffer from back and joint pain. Pilates works to re-train your movement patterning for better efficiency; working toward balanced strength and stamina around the joints. As the body feels more stable, flexibility becomes possible where it might not have been before. The result is ease and efficiency in motion, and more often than not – less pain. Specialized Pilates equipment makes it possible to load movement in an almost infinite number of ways. You’ll find yourself doing exercises lying down, sitting and standing up. You may be right side up or upside down or somewhere in between. Sometimes you’ll be on a stable surface, sometimes you’ll be on a moving platform. You’ll load the movement in various ways. Often, using a lower weight load can provide a surprisingly intense experience. A good Pilates teacher will ask you to notice how your body feels as you work through various exercises. As you concentrate on your movement, you’ll begin to notice when things feel connected and supported. This awareness makes it easier to look for similar sensations when you’re out in the world, doing your thing. You develop your balance and your ability to sense your body in space, which are important skills for moving around in life and sport. In my experience, many men I’ve worked with come to Pilates after they’ve had an injury of some kind. Their pain and dysfunction aren’t responding to the things they’ve tried and the ways they’re used to working through things. But once they discover Pilates offers some amazing possibilities beyond rehab, they’re hooked. It can be hard for a guy to walk in the door to the Pilates studio though, when he’s expecting a room full of women on the other side. At Moving Spirit, we’ve just launched a unique introduction to Pilates fitness program designed specifically for men. The Intro to Pilates for Men program combines seven 1-hr. group reformer/apparatus classes (4 participants, max) with one 1-hr. private appointment to give you a solid sense of what’s possible for you with Pilates training. It’s like personal training in a small group setting. We’ll assess your needs and goals, and cover the all the important Pilates basics to get you moving at your best. If you’re inspired – join us Monday nights in May and June. Your body will thank you! If you have questions – please leave us a note in the comments below, or email info@movingspirit.ca.